Hidden away in the linen cupboards at the Hill House, Team West discovered these beautiful finger bowl mats. The intricate drawings were created by Walter Blackie’s daughter, Alison. The Hill House was designed by Charles Rennie Mackintosh for the Glasgow book publisher Walter Blackie. Widely considered to be his finest domestic work, Mackintosh was given a free reign with the design to meet the unconventional tastes of his client. Walter Blackie and his family moved to the Hill House from their home in Dunblane in 1904. The Blackies chose Helensburgh as there were good transport links to Glasgow, and also because his children could enjoy growing up surrounded by countryside and nature. Alison Blackie was the second of four daughters and was 10 years old when they took up residency. She had a keen interest in art, which was no doubt nourished by her environment, and she later became a gifted amateur artist. 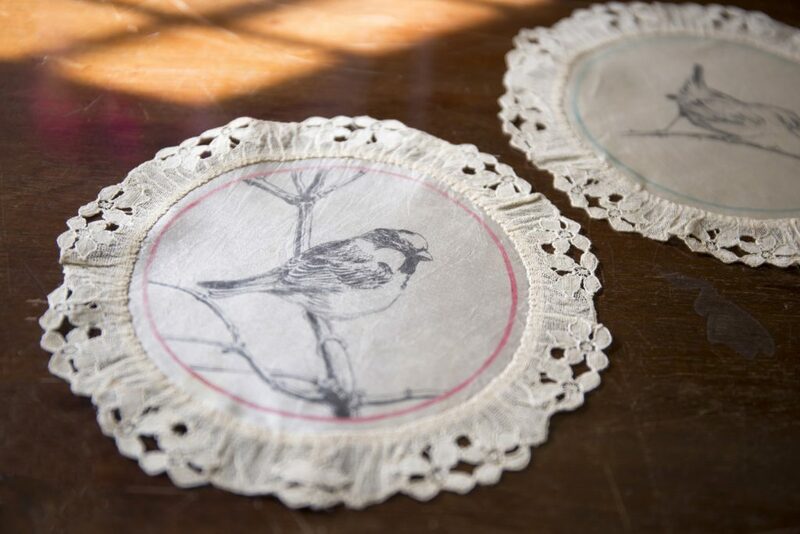 These intricate finger bowl mats were created by Alison, who used black ink to hand draw directly on to fine silk. This was then stitched to machine-embroidered lace to form a border around the drawing. The birds featured on the mats include stilts, a kingfisher, a wren and a house sparrow. Some of these birds are not found in the Helensburgh area so it’s possible that Alison saw the pictures in an illustrated book, perhaps from the family’s vast library. While these mats are beautiful, they also served a practical function. The mats were used under finger bowls when using the fruit service plates at the Hill House. Although not common now, finger bowls were once widely popular and considered an essential part of any formal dinner. Finger bowls are slightly smaller and shallower than an average soup bowl, and were usually half-filled with water which was often scented with citrus or flower petals. Their purpose was to cleanse fingers between courses, in this instance between dessert and coffee. Finger bowls declined in popularity during the 20th century as dining became less formal and table settings simplified. This article is by Demi Boyd, Inventory Officer, Project Reveal West. Project Reveal is a multi-site digitization project of unprecedented scale. With your support, we can help the Trust manage its collections more effectively. Most important, we can help the Trust discover, better understand, and share its treasures with the world. Originally published by the National Trust for Scotland on September 20, 2017.